Twelve years ago, Lorrie Ann Ortega left the tiny town of Clear Water with stars in her eyes. Now she's back home trying to live right and put her mistakes in the past. Even so, she'll never be the kind of woman who would make a good wife for the handsome widowed pastor, John Levi. But when she agrees to be nanny to his two sweet daughters, she's thrown constantly in his path. And she can't keep herself from dreaming that a man like John could one day love her. Can a prodigal daughter turn into a pastor's wife? 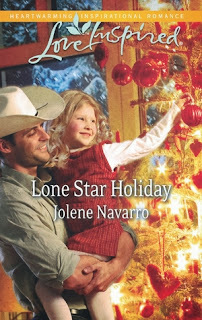 Lone Star Holiday was a sweet, fast paced Christmas story that offered a look into how bitterness and jealousy experienced in high school can shape shape a person into who they will become as an adult. Lorrie Ann had a rough childhood and a tough time in high school. After a falling out in high school, Lorrie Ann couldn't wait to get out of her small Texas town and go to LA. She makes out and doesn't look back for twelve years. When life starts to fall apart, Lorrie Ann knows that the only place for her to turn to is her aunt back in her small Texas town. John Levi is the first person Lorrie Ann runs into in Clear Water, Texas after her car runs out of gas. The first thing she notices is that he doesn't act like the guys from LA and it is refreshing. With his help, she makes it to the gas station and then on to her aunt's house. As Lorrie Ann's holiday progresses, she learns that John Levi is actually pastor John at her aunt's church. Through out the trip, Lorrie Ann keeps finding herself thrown in to Pastor John's path, especially when Lorrie Ann is volunteered by her aunt to help out with the town's Christmas pageant. Lorrie Ann soon discovers that the some of the people she grew up with, who kept her from wanting to come back, still had a chip on their shoulder, but Lorrie Ann also finds out that not everyone in town has the same attitude toward her. Lorrie Ann also sees that these girls have stayed bitter and in their high school mentality and have never moved on from their pecking order and Lorrie Ann is happy to be away from the drama. Lone Star Holiday was enjoyable. I really enjoyed reading the scene's with pastor John's daughter Celeste, she was funny little kid. Each character had great development and I felt a connection to Lorrie Ann. She struggled to find her place all while keeping a wall built up around her...or in her case an assortment of stylish clothes.